George Sutherland's distinction as Utah's only U.S. Supreme Court justice capped a long and distinguished legal and political career. Born on 25 March 1862 in England, he immigrated to the United States with his parents in 1863. They had joined the Church of Jesus Christ of Latter-day Saints in England, and by the 1870s the family had settled in Utah. His family later disaffected from the Mormon Church. From 1879 to 1881 Sutherland attended Brigham Young Academy and absorbed the Social Darwinism of Herbert Spencer as well as a reverence for the Constitution from Academy principal Karl G. Maeser -- both were ideas that would shape his life. In 1883 Sutherland had completed one term at the University of Michigan Law School and qualified for the Michigan bar. That summer he returned to Utah and married Rosamund Lee. They had three children -- Emma (born 1884), Philip (born 1886), and Edith (born 1888) -- whom he supported by practicing law in Utah. In 1894 he helped to organize the Utah State Bar Association. In 1896 Sutherland, a Republican, joined the first Utah House of Representatives. In 1899 he was admitted to the bar of the United States Supreme Court, and from 1900 to 1903 he served as Utah's only Representative in the U.S. House. He then served in the U.S. Senate from 1905 to 1916. During this period, he supported much progressive legislation, including a Utah law for an eight-hour day in the mining and smelting industries, as well as national statutes such as the Pure Food and Drug Act. Defeated for the Senate nomination in 1916, Sutherland went into private law practice, served as president of the American Bar Association, and became an advisor to Republican presidential hopeful Warren G. Harding in the campaign of 1920. 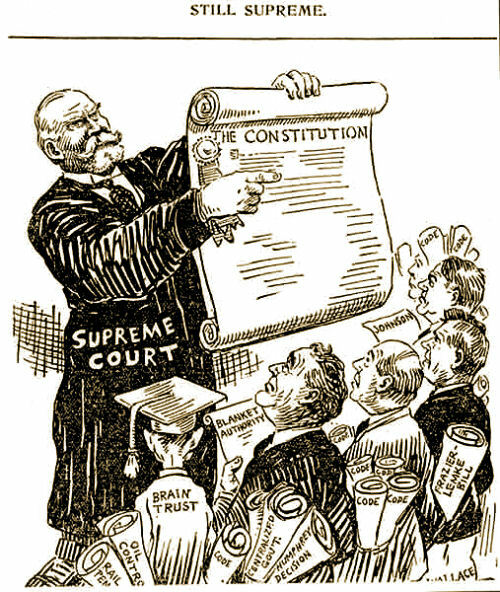 Harding's election and the sudden resignation of a Supreme Court justice in 1922 paved the way for Sutherland's appointment to the bench. In 1922, President Harding appointed Sutherland to the U.S. Supreme Court, where Sutherland became a jealous protector of individual liberty. One of his first cases, for example, was Adkins v. Lyons in which Sutherland supported a woman’s right to negotiate a wage contract for herself —- without state regulation. In a later case, New Ice Company v. Liebmann, Sutherland wrote the majority opinion that struck down an Oklahoma law that virtually prohibited anyone from entering the ice business to compete with the monopolistic New State Ice Company. As Sutherland was to discover, the New Ice case was the tip of an emerging iceberg in government regulation. In the thirties, he opposed most of the New Deal legislation, and became the intellectual leader of the "Four Horsemen" -- four conservative justices consistently voting against President Franklin D. Roosevelt's programs. The National Industrial Recovery Act (NRA), which was an early part of Franklin Roosevelt’s New Deal program, far surpassed the New State Ice Company in its threat to free enterprise. All major industries in the nation were invited to form cartels. They were urged to develop industry-wide codes that would regulate the prices charged for the products they made, wages paid, number of hours worked, and even the quality of products sold. These NRA rules would, in practice, be binding on all corporations in their industry, even those who opposed such interference. Over 500 NRA codes emerged, which stifled American production through higher prices for goods and lack of innovation in industry. As monetary expert Benjamin Anderson observed, “NRA was not a revival measure. It was an anti-revival measure.” Indeed, it was a major reason the Great Depression worsened in 1933. For example, the tailors of America decided in their code to establish 40 cents as the minimum price that could be charged to press a pair of pants. When Jack Magid in New Jersey charged a customer only 35 cents, he was sent to jail for breaking the law. In the Schechter Poultry Corporation v. U.S. case, Sutherland ruled against the NRA and for the rights of the Schechter brothers to sell chickens freely in New York City. Their main market was the Jewish community. Justices Sutherland and James McReynolds were effective in their questioning —- so effective that the audience frequently erupted in laughter as the government tried to explain why customers should not have been allowed to select the particular chickens they wished to purchase from the Schecters, but should have had them selected randomly instead. A political cartoon of that era. So persuasive was Sutherland, and so bad was the NRA, that the Supreme Court voted unanimously that the law was unconstitutional. Sutherland’s victory in declaring the NRA unconstitutional restored the principles of competition to American business, lowered prices for consumers, and stimulated product innovation. Three years later Sutherland retired from the court, leaving future generations to defend the Constitution. Seven decades after his landmark rebuke of the NRA we should remember him for his commitment to individual liberty and for temporarily halting the rise of big government. Sutherland was a quiet, unlikely hero. He retired from the Court in January 1938 and died on 18 July 1942. He retained the respect of his peers throughout his career and is highly rated by most historians for his Supreme Court performance. 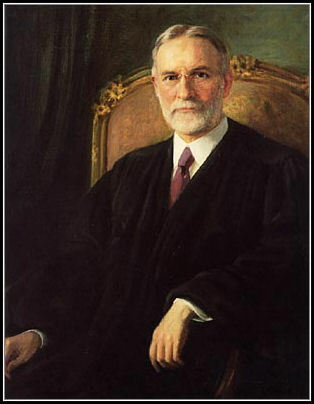 A footnote: George Sutherland was the last Supreme Court justice to have a full beard. While several other justices have sported minor facial hair (mustaches on Justices Marshall and Thomas, sideburns on Chief Justice Rehnquist), Justice Sutherland's face was covered in a thick, bushy white beard in the style of Karl G. Maeser. 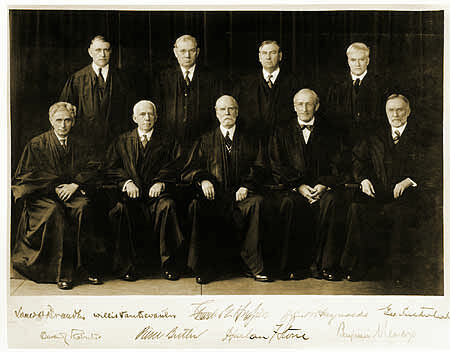 The Justices of the US Supreme Court pose for a photo in 1932. Justice George Sutherland, BYA High School Class of 1881, is the seated on the right side.